Mr. Daryle Rodgers, over the course of six years, has worked diligently to secure the Out of School Time/Extended Learning Department funding totaling over $8,000,000 for Hampton City Schools' students to participate in beneficial academic and enrichment programs. Mr. Rodgers, a Certified Grant Writer and the Out Of School Time Coordinator for Hampton City Schools, serves as the liaison between the school district and the City of Hampton's Youth Education and Family Services. He oversees and administers 21st Century, S.T.R.E.A.M. 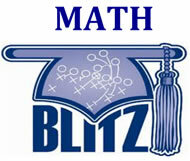 and Math Blitz programs in addition to developing academic tier 2 and tier 3 support programs for the district. Below are the fundamental concepts for the Out of School Time Department. Mission: To provide school-aged children with a diversity of educational, fun, and healthy lifestyle recreational opportunities which empower students and help them to succeed outside of the traditional school day. Vision: Out-of-School Time organization is a multifaceted team-oriented organization dedicated to helping every child every day whatever it takes to be "Ready by 21." Charge: To develop and implement measurable enrichment programs that assist students in achieving sustainable academic growth, improved social behavior, and enhanced physical fitness. Recipe for Success Motto: Fun with a scoop of educational and social development, and a side order of healthy living! To make sure the children of Hampton are "Ready by 21." Partners: Hampton City Schools and Youth Education and Family Services work as a team to develop our youth and empower Hampton Families. The mission of School Age Programs is to offer an inclusive program that offers a variety of program options for parents of elementary and middle school children for participation in a safe, structured, affordable program in an atmosphere that nurtures the social, physical and educational development of children. The School Age Program currently operates 24 after school program sites and 8 morning program sites that include 24 elementary schools and four middle school programs. Our program participants are in pre-kindergarten through eighth grade with a portion of those students with IEP’s (Individual Education Plans) which include special needs ranging from ADHD and developmental delays to speech impairments. The suitability of these students for inclusion in the before or after school program is determined by an assessment process though HPRD Therapeutics and allows us the opportunity to provide services to a diverse group of students with special needs. Morning programs begin at 7:00 am and operate for approximately 2 hours per day. Afternoon programs have staggered schedule start times with the majority of programs beginning at 2:05 pm with all programs ending at 6:00 pm. After School programs average 3-4 hours per day. There are 95 employees that support the operation of School Age Programs on a daily basis. These employees are spread throughout the 29 (before and after care) fee based school program sites. We offer our staff 3 mandatory trainings per year that are a minimum of 4 hours each giving staff the opportunity to fulfill the 12 hours required for after school professionals each year based on National After School Association standards. Trainings are planned and implemented by our program coordinators partnering with many City and Hampton City School departments as Resources. Coordinators also ensure that all staff completes mandatory CPR and First Aid Training. School Age Programs has maintained a record of low price high quality programs making them affordable for most families with Weekly rates of $45.00 and $40.00 for the 2nd child. AM Program rates are $20 per week. We also have available five-day passes $25.00 am and $50.00 pm. Five day passes may be used any day during the school year and expire the last day of school. In addition to these low rates we also participate with the Department of Social Services Child Care Provider for qualified families. Parents or guardians can check with their caseworker to obtain eligibility. Each of our programs offers homework time and a snack followed by planned activities, which can include arts and crafts, indoor/outdoor sports, enrichment programs, seasonal projects and other special activities. For a consistent balance of activities each program has a monthly calendar that guides the leader in implementing a well-rounded program no matter where the program may be located. All program sites also receive Enrichment programs that enhance the students’ exposure to cultural, educational and physical activities to which they may not ordinarily have access. Each program site receives an average of 11 enrichment programs per year. A significant number of those programs are provided through different divisions of Parks and Recreation such as the Rock Wall, Clean City, Sandy Bottom Nature Park, the History Museum and the fitness program along with 4-H programs. These activities are brought to after school at no cost or very low cost to each program site. SAP enrichment staff and professional service vendors supplement these programs. During the summer months School Age Programs operates 4 Adventure Camp Programs, with approximately 40 children each, a Club 11-15 Camp for Pre-teens and teens with approximately 65 students. Camps operate 7:00 am – 6:00 pm Monday-Friday. These camps operate in partnership with Hampton City Schools and the Teen Center who each provide space for our summer 8-9 week camps. The camps include field trips, weekly swimming, arts & crafts, games and academic enrichment. In conjunction with the Hampton Healthy Families department of the City of Hampton the Out of School Time Department (OST) provides support for the School Age Programs (SAP). The OST department provides quarterly analytical data of all SAP students in 23 schools to help align academic tutoring and behavior models. The OST and the HCS curriculum department provides a yearly training for all SAP staff to help the to align tutoring with HCS curriculum. In addition the OST department hired and trained several tutors to, actively tutor SAP students during their program. The schools serviced by tutors are: Andrews PK-8, Asbury, Phenix PK-8, Langley, Phillips, Tucker-Capps, Smith, Burbank, Tyler, Bassette, Cary, Barron, Cooper and Machen. What does your program offer my child? Each of our programs offers homework time and a snack followed by planned activities, which can include arts and crafts, indoor/outdoor sports, enrichment programs, seasonal projects and other special activities. For a consistent balance of activities each program has a monthly calendar, which guides the leader in implementing a well-rounded program no matter where the program may be located. All program sites also receive Enrichment programs that enhance the students’ exposure to cultural, educational and physical activities to which they may not ordinarily have access. Each program receives an average of 11 enrichment programs per year. Do you serve a snack? Snacks are served in the after school program only. What schools have AM programs? Andrews, Armstrong, Barron, Cooper, Eaton Middle, Jones Middle, Moton Pre-K, Spratley Gifted Center, and Tucker Capps all have AM (before School programs.) Before School Programs are based on a minimum of 15 students enrolled. Continuation of these programs is based on meeting minimum participation requirements. What schools have PM programs? What is your main office telephone number? 727-1300 option 4. Fax to 727-1823. The SAP website is currently under construction through Hampton Healthy Families. Any links currently found on-line are not valid and contain expired or incorrect information. Please call 727-1300 option 4 for updated information. What is the phone number of my child’s program site? At times the Hampton City Schools close early or all afterschool activities are cancelled due to inclement weather. In such cases we will open immediately. To ensure the safety of your child and our staff in weather that poses a threat of road closures or power failures we request that you or your emergency contact pick up your child within 2 hours when notified that school buildings are closing. If schools close for the entire day; which will be announced on radio and TV, before and after school will also be closed. If school openings are delayed 1 or 2 hours, we will not have Before School programs that day. Each family is encouraged to have an alternate plan of action in case of early program close due to bad weather or in the event of an emergency. Parents/Guardians are responsible for updating contact information so that if conditions worsen there will be ample time to get in touch with you or your emergency contact. Refunds are not given for program cancellations due to inclement weather. What happens if my child’s school closes early due to an emergency or inclement weather? What are the program hours on early release/early close days? Is School Age Programs open on days schools are not in session? Payments are due weekly on Tuesday at a rate of $45 a week for After school care with each additional child rate of $40 for PM care. Before school care is $20 a week with each additional child rate of $17 for AM. 5-day passes may be purchased at a rate of $50 for PM and $25 for AM. There is no discount additional child rate for 5-day passes. These passes require 24-hrs notice prior to the day child will be attending the program. They are good for the current school year and unused passes/days are non-refundable. There is a non-refundable registration fee of $20 per child. Check and Money Order payments may be paid at your child’s program site. Credit Cards payments are accepted at the main office located at 100 Old Hampton Lane (Healthy Families Partnership Building) M-F between the hours of 9am-4pm. All program payments are due weekly on the Tuesday prior to the upcoming program week. 5-day pass purchases may be made on or prior to the first pass day used. What if I don’t make a payment on its due date? Your child will not be permitted to enter into School Age Programs if you have not made a payment. A $10 late payment fee is added per week per child that program payment is late. What are the program hours? When is the program open for operation? AM sites open at 7AM and dismissal at the school opening bell. PM sites open upon school dismissal and run until 6PM. 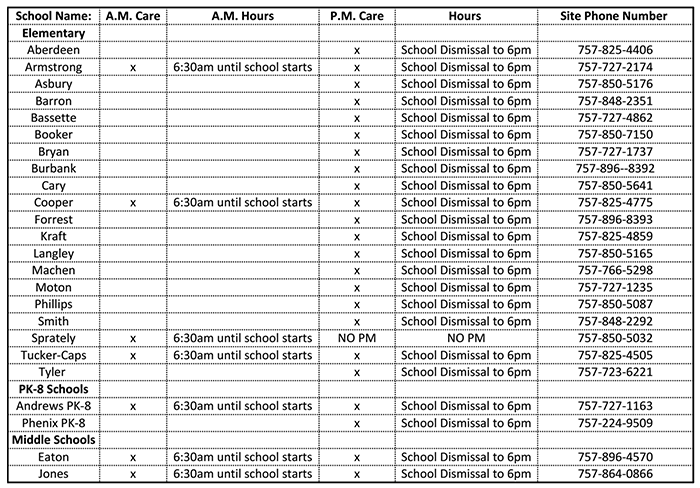 School Age Programs operates on the Hampton City Schools Calendar; we do not operate when school is closed. Weekly program fees are only refundable if children are withdrawn from Hampton City Schools (with the exception of suspension/expulsion) and must be requested within 30 days of withdrawal. 5-day passes are non-refundable even if no day usage has taken place. Please present verification of withdraw from Hampton City Schools within 30days from withdrawal date to the main office located at 100 Old Hampton Lane (Healthy Families Partnership Building). Last year’s Fourth Annual Extended Learning Time Symposium hosted more than 90 participants from multiple agencies and businesses representing Hampton and neighboring cities. The symposium was open to any Hampton-based daycare, home school, private school, and faith-based programs that service pre-kindergarten through eighth grade students in any form of before/after-school, tutoring based programs. During the session, local business partners learned about variety of student enrichment opportunities, technology and innovative curriculum resources, and STEM activities that enhance and support learning experiences for students. Meredith Scott Lynn, actress and CEO of WRITE BRAIN, and Dr. John Hodge, author and president of the Urban Learning and Leadership Center, served as the guest speakers. Listed below is the link to the agenda from this event. Please be on the lookout for the 5th Annual Extended-Learning Symposium. The primary goals of Title IV: 21st Century Community Learning Centers (21CCLC) extended learning programs are to provide quality academic and social enrichment through active learning during out-of-school time and to serve the whole child through family enrichment and community support. 21CCLC helps students meet state and local standards in core academic subjects, such as reading and mathematics; offers students enrichment activities that complement regular academic programs; and offers literacy support and other educational services to the families of participating children. Students that participate in the 21st Century Community Learning Center’s before/after-school and summer camp, are exposed to an alternative learning environment led by teachers and enrichment providers that utilize problem-based learning practices to teach 21st century life skills. Staff and program partners work collaboratively to provide a “holistic” education environment that support and encourage excellence in academics and citizenship. Additionally, Hampton City Schools serves as the co-applicant for the 21st CCLC Gators Presidential Scholars (GPS) program which is administered through Alternatives, Incorporated. Through a competitive process, the Virginia Department of Education funds projects that provide significantly expanded learning opportunities for children and youth, and that will assist students to meet or exceed state and local standards in core academic subjects. S.T.R.E.A.M. (Science/Technology, Recreation/Redirection (mentoring), Engineering, Engaging Academics, Art, and Math) is a holistic program geared to foster students STEM- based thinking as it relates to innovations, research, and youth leadership. 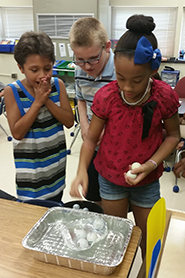 Nominated by teachers and administrators, students that attend the extended-learning school year club and summer camp strategically focus on academic development through project-based learning. Those who attend the program engage in hands-on learning that focuses on academic support, recreation and mentoring sessions. A main staple of the S.T.R.E.A.M. program is the “Shark Tank” curriculum. Shark tank is a student lead innovative class that focuses on the concepts of stem and oral presentation. An additional benefit of the program is the implementation of field trips, which serve as a valuable learning experience for students. The field trips are created to enhance student-learning goals and explore community resources through our unique partnerships. Hampton City Schools’ Out of School Time Department is honored to work with the following community partners that provide unique learning experiences for our children. S.T.R.E.A.M. sites are spread throughout elementary and middle schools of within he district. Qualifying schools receive USDA funded snacks during the program and transportation is provided for eligible school age participants. Want to see us in action? Check out the videos below from some of our engaging field trips! Initially established in the fall of 2012, the Hampton City Schools “Math Blitz program” targets elementary and middle school students who are at risk of/or have failed the Virginia Department of Education’s Math Standards of Learning Assessment. These students participate in tutoring sessions provided by teachers and instructional specialists outside of normal school hours. Additionally, they receive a free USDA snack, and transportation is provided for eligible participants. Working with Hampton City Schools’ Math Department, the Math Blitz curriculum has a long tradition of providing sound extended learning opportunities to those it serves. Due to the program’s proactive approach to aiding students’ academic accomplishments, the past 5 years have been instrumental in student success. During the 2016-17 SY, participants scored an average of 14.7 points higher on the 2017 Math Standards of Learning (SOL) as compared to their 2016 Math SOL score. 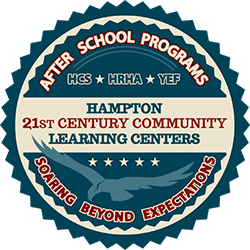 In an effort to better serve the City of Hampton, the Out of School Time Department has established this site to provide resources to community organizations that engage in before and after school programs. The following links assist with aligning tutoring and academic efforts that coincide with Hampton City Schools and the Virginia Department of Education’s curriculum and standards. Also search STEM activities for fun hands-on experiments that can be used in an out of school setting. Please visit the Governors Youth Development Academy (GYDA) website that the students at Phoebus and their coordinator Mrs. Wheat developed. GYDA is the program that we teamed with Newport News Public Schools to apply, and awarded a grant that services 9th and 10th grade students in the areas of: Career Readiness, College Readiness and STEM. See website below.